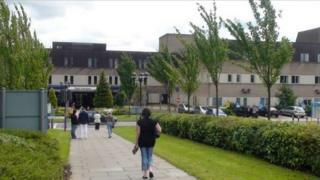 No overnight GP service will be available at a West Lothian hospital for nine nights in May due to staff shortages. The GP out-of-hours service will not see patients in St John's Hospital between midnight and 08:00. NHS Lothian said about seven patients per night would be affected by the reduction in the service. Patients are being told to call NHS 24 if they need medical help during the suspended service nights. A GP will be available in West Lothian to visit any housebound patients who need care overnight. Dr Sian Tucker, clinical director of the Lothian Unscheduled Care Service (LUCS), said: "The decision to reduce the service in a planned and coordinated way has been taken because of staffing issues, which means there are not enough nurses to fill the nursing rota. Despite training additional nurses, the service has been unable to keep up with the loss to day time General Practice. "We have put in place a number of short and long-term actions to help tackle the issues, including increased recruitment and training and we are working with colleagues in daytime services. "However the situation remains precarious and we anticipate that it will be exacerbated by annual leave over the summer months. "Therefore it may be September before we see any encouraging change."